I like my soups like my people, warm and hearty, and this one doesn’t disappoint. 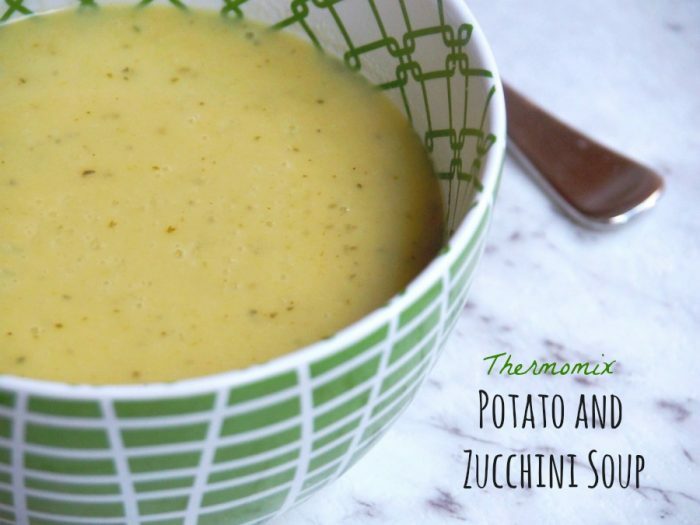 The zucchini makes it green but not mean and the potatoes make bring some hearty to this soupy party! 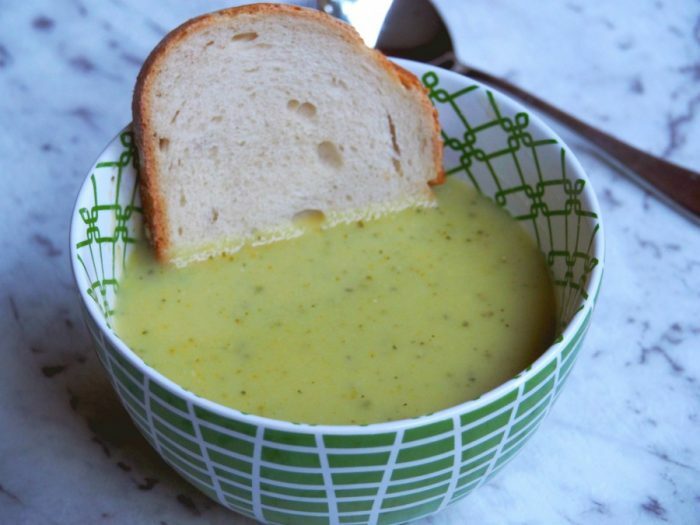 This soup is deliciously rich and creamy and so flavourful, that you’ll feel like an extra on the set of Oliver asking, “please sir, can I have some more” because you will definitely want some seconds! I’ve given this recipe a bit of a makeover with some shiny new pics and since the original posting, I’ve discovered that parmesan cheese is not vegetarian. Who knew?! Not me, obviously! 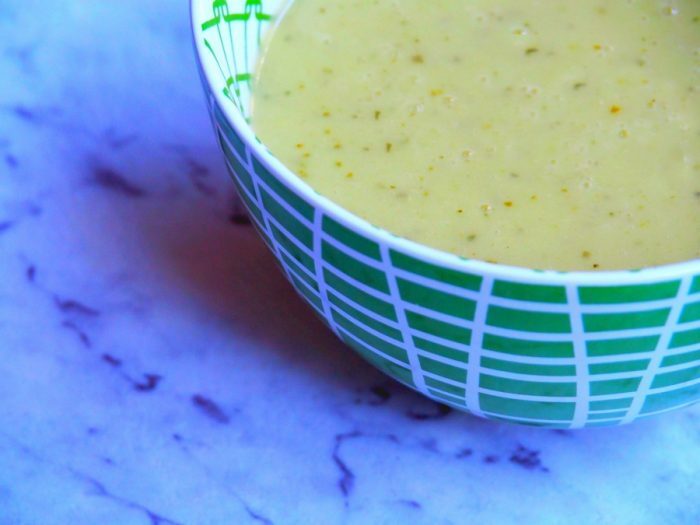 However, if you want a vegetarian soup, simply swap out the parmesan for a vegetarian alternative, or simply add 1 tablespoon of nutritional yeast at stage 7 and you’ll be right! One of the best things about the interwebs are the absolutely fabulous people you can meet there, and Stephanie is one of those people. One day when we were having a soup-er chat on facebook, she shared this, her favourite soup recipe. I was totally stoked because not only is it full of flavour but because one of my 101 things to do in 1001 days is to try making 10 new soups. This was just the first of many but it shot right to the top of the soup-er league! How do you like your soups? What’s your favourite soup of all time? Place parmesan into TM bowl and chop for 6 seconds on speed 9. Set aside. Don’t wash the bowl. Add onions and garlic into TM bowl and chop for 10 seconds on speed 6. Add potatoes and zucchini. Chop for 5 seconds on speed 6. Add stock, mustard, cornflour and water and cook for 20 minutes at 100C on speed 1. Blend slowly for 30 seconds by slowly going from speed 1 to speed 8. Add parmesan, pepper and sour cream (if using) and blend for 30 seconds slowly going from speed 1 to speed 8.